A successful Mount Kenya trekking requires stamina and a good physical condition, two inputs which every climber must individually deliver. They must then be backed up by good planning from your climbing outfitter. The planning must aim to make the climbers adapt easily to the high altitude. Mount Kenya, sitting on the Equator, is the second highest mountain in Africa after Kilimanjaro. Point Lenana at 4985m is a non-technical mountain trek, which anyone in good physical condition can do. No matter how physically fit climbers are, many who attempt Mt. Kenya treks soon after landing in Kenya struggle to reach Point Lenana because they can not adapt quickly to the altitude. It is worth noting that the combined effect of high altitude and jet lag is not the most conducive for a physically exhausting activity undertaken too quickly. From our experience, pre-mountain hiking in high altitude before the mountain trekking is the surest way of altitude adaptation and it guarantees an enjoyable climb. We would like you to make an informed decision about your Mount Kenya safaris. Do you want to enjoy or endure it? There are many mountain packages that will promise to take you to Point Lenana on "3 days flat". 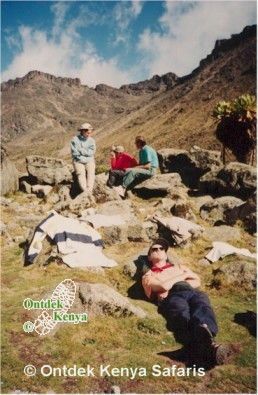 This type of tour starts from the gate of the Mount Kenya Park with no pre-mountain hiking and no acclimatization day in the mountain. 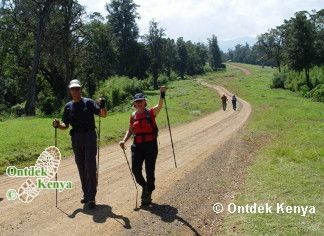 Ontdek Kenya safaris offers you mountain treks that prepares you thoroughly with the bonus that all our pre-mountain hikes are in the game rich areas of the Aberdares, Sangare, Solio, Rift Valley and Masai Mara, making your mountain trip become one with wonderful opportunities for wildlife viewing. This itinerary features the Sirimon - Naro Moru route for circumnavigation getting scenic and different views of Mount Kenya. This Mt. Kenya trek takes you through our favorite destinations where you can walk away from mass tourism: Crater Lake and Crescent Island sanctuaries, Hell’s Gate National Park, with easy to see game such as Giraffes, Waterbucks, Elands, Zebras and various Gazelles. Go directly to the itinerary. A safari in Masai Mara, the Africa that everyone dreams of has Elephants, Lions, Leopards, Cheetahs, Topis and Hippos all calling for our attention. This trekking ascends via Sirimon route and descends via the Naro Moru route, both very scenic routes with different landscapes. This is a fully supported Mount Kenya climb with accommodation in mountain huts. To plan your Mt.Kenya climbing expedition, contact Ontdek Kenya Safaris. Benefit from our many years of experience in Mt.Kenya trekkings.